I just found a photo which goes with one I posted last week. Last week was the anniversary of my grandmother’s birthday and I posted a page from her high school graduation scrapbook. Then I posted a photo my father had taken in the eighties of her with her four siblings and all their spouses–the whole Mulder family. 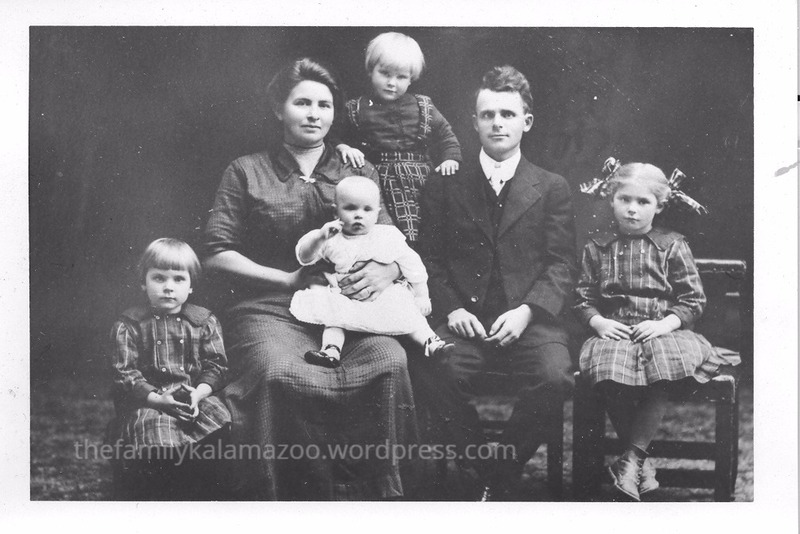 Here is a beautiful image of the four oldest Mulder children (Dorothy, Edna, Vena, and Pete) with their parents, my great-grandparents, Charles and Clara Mulder. This photo would be before 1917 as Charles wasn’t yet born. Notice how Dorothy and Edna have matching plaid dresses on. Although they were a year apart in age, they graduated high school at the same time. It looks like they were almost treated as twins. Vena (Alvena), the youngest daughter, is wearing an outfit which matches the older girls’ dresses, but appears to be a skirt with straps. How do you like those “Dutch boy” hair cuts from almost 100 years ago?! Thanks, Sheila. Other than the clothes and hair styles it could be a family photo today, I think. Such a lovely photo. Clara looks so mellow with a madonna smile on her face. Little Edna looks serious, as if she is concentrating on the photographer. Alvena looks happy at the apex of the family arrangement. I agree about their expressions. So cute. The only thing I miss is Uncle Chuck in the photo, but too soon for that! Catherine, I agree. Cuties, aren’t they?! Love those connections with our own past, our own roots! Linda, thanks so much. It’s so wonderful to have these photos! The photos that you post always catch my eye and make me want to read more! Aw, that’s so sweet, Jackie! I guess they are photogenic ;)! Very nice Blog! A lot of hard work has been done to research your family. Thanks so much! Yes, and it’s all ongoin! I read your post about the estate sale findings yesterday, and I will respond over there eventually. But I was so bothered by it, I had to let it sit in my head for a while. So it’s a great post! Yes I also find it depressing myself. You can’t help but wonder about how or why they seem to care so little about their own family history.